Auto buyers have said they’re tired of the status quo when it comes to the vehicle buying process and they want a better experience. They’re also willing to pay more for that experience, provided it meets their expectations. But what are those expectations? And how do dealers go about making that better experience a reality? 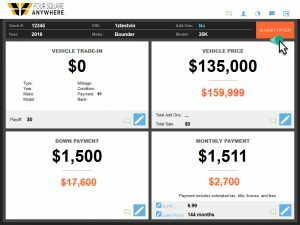 Four Square Anywhere integrates with the inventory on your website to allow buyers to structure the purchase of vehicles based on the sale price that you’ve established. Whether you use Central Desk or a local Sales Manager, your shopper’s deal gets immediate attention and response. Counter offers can be made with one click in real-time while your buyer is standing by, and the buyer can accept the deal and make a deposit right then, right there. In just minutes you’ve sold the vehicle and created a happy buyer. This is streamlined negotiation with Four Square Anywhere. Value their trade with built-in KBB and NADA Guides . . . Choose to pay cash or finance . . . Choose their down payment and monthly payment . . .
Work with all the numbers on the four square until they’re happy with the deal . . .
Add finance and after-market add-ons . . . Submit the complete package to you along with their credit app. You can respond back with a counter offer or acceptance and complete the deal. Four Square Anywhere CHANGES EVERYTHING! Improves the overall buying experience. If you’ve ever wished you could clone your best Desk Manager and put him at each of your dealerships, you’re not alone. We designed Four Square Anywhere’s Central Desk to enable you to receive and negotiate every offer from one or any number of dealership locations. Your best Desk Manager, or an entire team, really can receive every offer in real time, communicate with the buyer or sales staff, and process a counter offer or approval in mere minutes, eliminating the unnecessary wait time that frustrates buyers. “Buyers want a simple, pressure-free shopping experience . . . ” Working from a tablet or mobile device, sales staff can submit customer offers to the Desk when the time is right — even during a test drive or at off-site locales — all while remaining attentive and engaged with the customer. Website integration and in-store kiosks also encourage independent buyer offers directly from the customer. And Four Square Anywhere is ideal for off-site sales events. When offers are submitted to a Central Desk, mobility leads to endless new opportunities to quickly process and close sales. “I may have paid more, but the experience was worth it . . . “ Sales thrive with tried and true processes that aim for your target gross, offer F&I solutions to every buyer, and present aftermarket options with every deal. Central Desking inspires a complete and uniform sales process that customers view as positive, helpful, and time-saving. Four Square Anywhere will create a huge shift in paradigm, to a new place where buyers don’t mind paying more for an overall better experience. And the buzz created by customer satisfaction will drive in more and more buyers who are looking for the same amazing experience. Four Square Anywhere will drive high levels of buyer satisfaction and make 5-star ratings your new normal. Call Us at 707-867-1615 or click to Request A Demo and see Four Square Anywhere in action.